"Legally Blonde 2: Red, White & Blonde" got some rosy reviews from three Washington attorneys. The sequel picks up from where Elle Woods left off two years ago. This time, the idealistic fair-haired and fashionable Harvard attorney takes on the Washington establishment over animal testing. 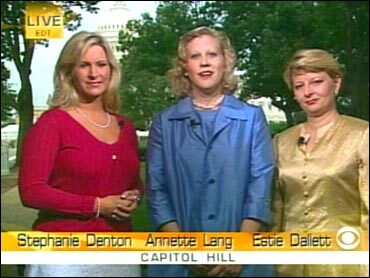 Like Reese Witherspoon's character Elle Woods, Annette Lang, Estie Dallett and Stephanie Denton are all Washington attorneys, graduates of Harvard Law School and blondes. The three were asked to review the film for USA Today. In her review, Denton writes, "What do smart blondes and UFOs have in common?You've heard about them but most of you never have seen them." She tells The Early Show co-anchor Harry Smith, she feels like Elle Woods, "I'm very lucky. I don't think it's too hard. Sure, there are challenges, but in the end, it's a good thing." She adds, "I think you have to prove yourself professionally. And show people you are a serious person, even though you may not look it." What surprised Lang about the film was Wood's positive attitude and the way she treats everyone with dignity and respect. She says, "As we all know, Washington, D.C., sometimes can be a little bit too negative. It's not a fantasy world here. It's the real world, but you have some wonderful people. You have a lot of idealists like Elle, who come here young, trying to do the right thing, trying to make positive change, and sometimes they have to lose their illusions in order to get smaller changes to take place. But it has its negatives and positives like any place. I think, unfortunately these days the negatives are on the too-high side." So is it a dog-eat-dog world there? Dallett notes, "In Washington there are many of us at the White House who have dogs and love to take our dogs out. We weren't necessarily as lucky as Elle, to be able to take our dogs with us everywhere. But our dogs treat each other better than some of the people around here treat each other. It's not really fair to compare them." Overall, the three blonde Washington attorneys say they would recommend the movie to others, with some qualifications. All tree say they did the review for USA Today just for the fun of it. "Washington itself tends to take itself too seriously," says Lang. "This is just a light fun movie."